"What happened?" to which he answered, "nothing, nothing." She related she did know to what they were referring. She stated, according to Mr. Silva, that during the time the two boys were outside she heard another loud crash in the basement, this time it was under the room in which the ping-pong table is located. John then left the house, and she believes he left in the car. After the two boys left, she went to clean the room in which the boys had been watching TV, and related to Mr. Silva that she observed on one of the tables what appeared to be smears of blood as if from three fingers. She did not think anything of this and cleaned it up. John stated, as he did on the interview of 11/5/75, that he had arrived at his house between 11:00 pm to 11:30 pm, on 10/30/75 and had gone to bed shortly thereafter. At about 3:30 am, he was awakened by his mother who advised him that Martha had not come home. John proceeded to get dressed and went out to conduct a motor search of the Belle Haven area. His search also took him to Riverside, Cos Cob, and the Bruce Park areas of town. He completed his search at about 6:00 am, 10/31/75 and returned home. Instead of returning to his bedroom to sleep, John advised that he was very tired and fell asleep on a sofa in the family TV room. John woke up sometime before 9:00 am, 10/31/75 and a friend, one John Harvey, came over to the house. Both he and John Harvey watched some television and after securing the TV set, he and Harvey left the house and went to a wooded area to the rear of the residence. Their reason was to check behind an eight foot wall, directly to the rear of the house which had a large pile of brush in a pile [sic]. After checking there they returned to the house. John could not recall any women asking him any questions that he would have replied "Nothing, nothing." He commented that he could have said something to that effect, but that it was possible that he made the statement. When asked if he heard the two loud noises that Theresa had heard, John stated that he had not heard anything nor was he responsible for making them. 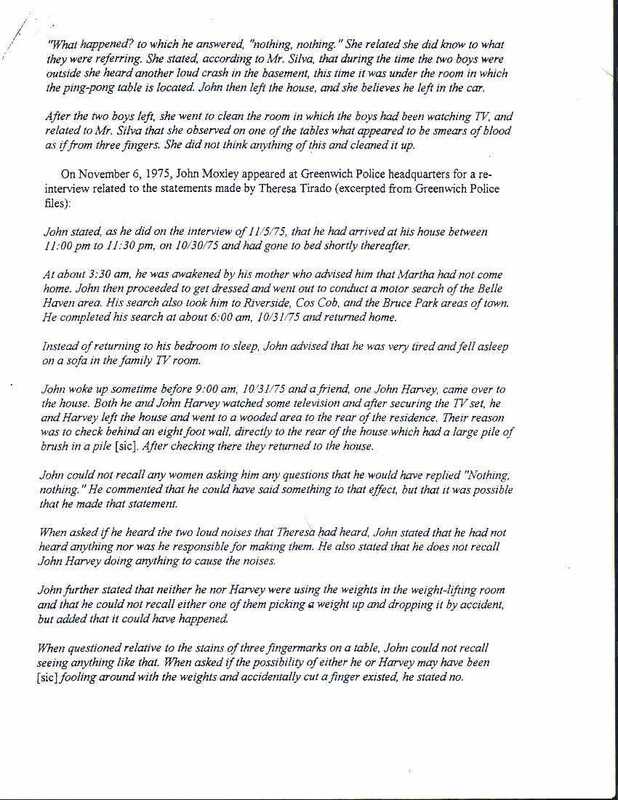 He also stated that he does not recall John Harvey doing anything to cause the noises. John further stated that neither he nor Harvey were using the weights in the weight-lifting room and that he could not recall either one of them picking a weight up and dropping it by accident, but added that it could have happened. When questioned relative to the stains of three fingermarks on a table, John could not recall seeing anything like that. When asked if the possibility of either he or Harvey may have been [sic] fooling around with the weights and accidentally cut a finger existed, he stated no.